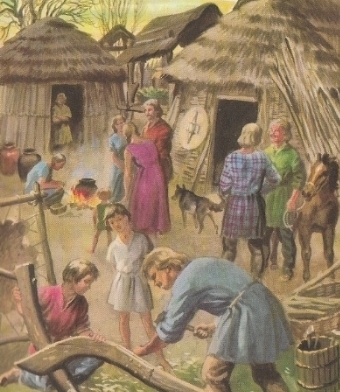 Polyandry in Late Iron Age and Roman Britain - Myth or Reality? Couldn't resist this Ladybird book image of Julius Caesar's Britain ... so who's married to who? It's been a while since anyone took much notice of Julius Caesar's writings on ancient Britain as any kind of credible social commentary. There's not only the problem that he was writing for a particular audience and in a particular style - there's also the issue that so little of what he says about Britain matches the archaeological evidence. But that's not to say that his words aren't worth looking at. His statements about (at least some) British marriages tantalise us with their allusions not just to polygamous unions but to a rare form of this known as 'polyandry' - the marriage of a woman to more than one man - as well as to how the children of these marriages were made legitimate.